Our guest post comes from Lynn Armitage, a freelance travel writer who lives in Northern California. You can reach her at: Boatfolk@aol.com. 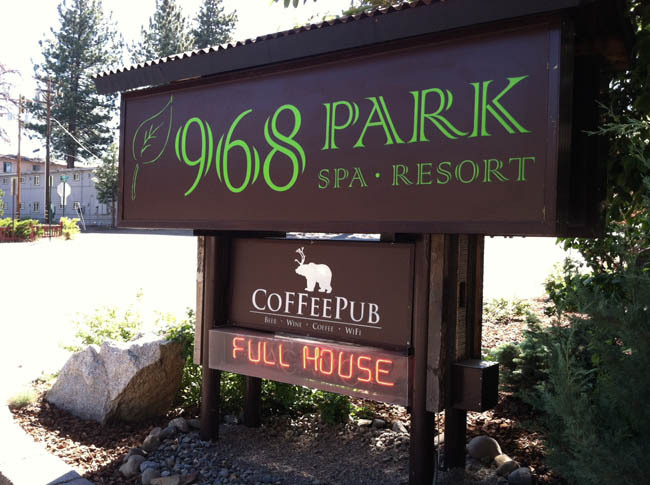 Drive down the main drag in South Lake Tahoe, and you’ll see accommodations galore. Some of the low-end motel variety; others, high-rise time-shares; and of course, the casinos beckon for your bedtime buck, too. But just off Tahoe Blvd, one block from the Heavenly Village shops and gondola, which is arguably the hub of town, is 968 Park Hotel, a very unassuming property that you would most likely drive right by if you weren’t looking for it. But you best turn around, and park yourself right there for the night, because you’re in for a real treat. They had me at “rustic.” I’ve stayed in environmentally friendly hotels before, where occasional homage is paid toward Mother Earth. But I must applaud 968 Park Hotel’s 110% commitment to green living and eco-friendliness at every turn. First off, the wood outside the building has been recycled from an old barn and whiskey distillery, and used to create the cozy benches and inviting bar inside the lounge, too. 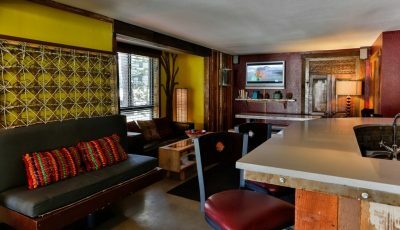 The bar and lounge area, complete with free wi-fi, is one of those places that draws you in for a quick one and keeps you there for a spell. 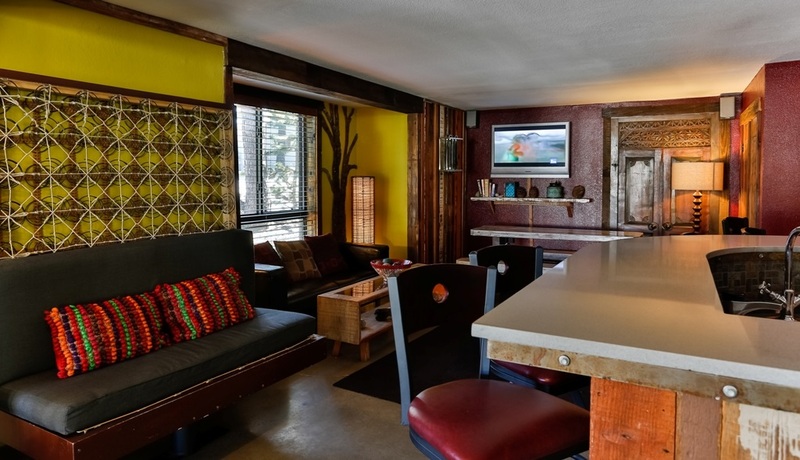 Maybe it’s the warm woods, or the funky artwork, such as the old box spring made into wall art or the decorative tree trunk made out of real bark. Personally, I was drawn to the two heavy wooden doors imported from Bali that were propped up against the wall. While in most places, these doors would seem a tad pretentious and out of place, they really worked here. The wallpaper throughout the hotel is made from recycled newspaper. The finish on the wall is made of clay, which is odor-resistant. All these thoughtful, green details aside, the absolute crowning touch is the bed, the whole reason why you check into a hotel to begin with. 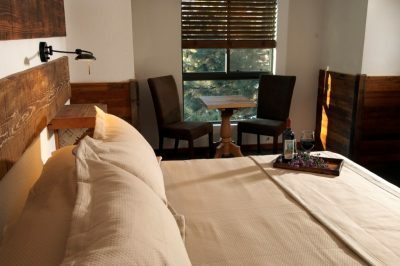 I have stayed in enough hotels to confidently say that the beds at 968 Park Hotel are by far THE. MOST. COMFORTABLE. BEDS. I have ever had the pleasure of sleeping in. The gal at the front desk told me that the mattresses are from the Sterling Sleep company, which I know nothing about. She said that each bed cost about $2,000 and because they are so comfortable, she bought a system for herself. (A ringing endorsement in my book.) The beds are all EPA-approved and designed to repel dust mites and bed bugs. The icing on the cake, rather, the 1,000-count sheets on the bed, were THE.SOFTEST.SHEETS. I have ever had the pleasure of sleeping under. We will definitely be back. The ONLY downside is that there is no air-conditioning in the rooms. Not that you need it with the cooling mountain breeze blowing through the tall pine trees right outside your window. But I heard that the rooms on the third floor can get a little stifling (the one and only drawback from using jeans as insulation). But Rich told me that they would be installing a complete air conditioning system throughout the hotel in a few months. After that, the hotel will be the PERFECT place to stay in Lake Tahoe. Of course, you have many dining options in Lake Tahoe. But probably the most iconic place to eat is at the Forest Buffet, located at the very-tippy-top of Harrah’s Lake Tahoe on the 18th floor. I recall going to the Forest Buffet as a teenager on vacation with my parents, if that tells you anything about its staying power. People go to the Forest Buffet for its legendary view – the most picturesque, panoramic view of Lake Tahoe anywhere through floor-to-ceiling glass windows that wrap around the dining area – and the incredible selection of freshly prepared food is simply a bonus. Or is it the other way around? With hand-carved meats, super-fresh sushi, crab legs, pizza hot out of a wood-fired oven, soups, pasta, chili, delectable veggies, an endless salad bar and a section of the restaurant devoted exclusively to desserts too many and too wonderful to count (including crepes made right before your very eyes), it’s no wonder the Forest Buffet is continuously voted the “Best Buffet” in the annual Best of Tahoe Reader’s Poll conducted by the Tahoe Daily Tribune.